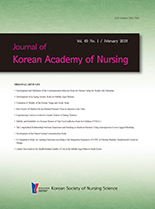 김자옥, 김인숙,(2012).아로마 자가발반사마사지가 농촌 중년여성의 스트레스와 면역 반응 및 피로에 미치는 효과.대한간호과학회지,42(5),709-718. Purpose: This study was done to examine the effects of aroma self-foot reflexology massage on stress and immune responses and fatigue in middle-aged women in rural areas. Methods: The study was a nonequivalent control group pre-post test design. The participants were 52 middle-aged women from rural areas of which 26 were assigned to the experimental group and 26 to the control group. Data were collected from July to September, 2011 and analyzed using SPSS Win 17.0 version program. The intervention was conducted 3 times a week for six weeks. Results: There were significant differences in reported perceived stress, systolic blood pressure, diastolic blood pressure and fatigue between the two groups. However, the issue of salivary cortisol and immune response were not significant. Conclusion: Aroma self-foot reflexology massage can be utilized as an effective intervention for perceived stress, systolic blood pressure, diastolic blood pressure and fatigue in middle-aged woman in rural areas.